We are garden fairies and we have been watching this blog wondering if anyone was going to post anything and we didn't see anyone posting anything, so we decided, once again, to take matters into our own hands and post something. We have decided to provide an official winter update on the goings on around here. One of the goings on around here is that the pillywiggins pulled a fast one on Carol and poked a snowdrop bloom up out of the ground on Saturday, last, that would be the 24th of January. Well, that is the earliest Carol has ever seen a snowdrop bloom around here. Or any bloom for that matter. You should have seen how excited she was and how many pictures she took of that one little snowdrop. It was worse than a plague of paparazzi at the opening of a flower show. And the snowdrop wasn't even fully open. But that one snowdrop bloom on Saturday, last, that would be the 24th of January, apparently wasn't enough excitement and hilarity for the pillywiggins. Indeed, no. So they pushed up a second bloom. Goodness gracious, we thought Carol was going to have another fit of excitement but she took it all in stride as though of course she would have early blooms in her garden, as early as Saturday, last, that would be the 24th of January. It's no wonder the snowdrops are blooming around here, as early as Saturday, last, the 24th of January. The snow fairies are completely off their game and as a result, we just haven't gotten that much snow around here. We've heard rumors that the snow is all several hundred miles to the east and north of here to which we say thank goodness. But at the same time, we won't feel like it has been much of a winter if the snow fairies don't give us a little bit of snow now and again. Of course, we don't want to encourage the ice fairies. Snow is one thing, ice is quite another. Brrrr.. Anyway, you know what else is going on around here? That's right. Nothing. Carol has not ordered the first packet of seeds. We are going to work on her to order seeds this weekend. It is supposed to snow which we think will remind her to order up some seeds. It is good to see that someone is looking after this garden and Gardener. Dear Violet, Thank you for taking over for Carol today--I have been wondering about all of you and what you have been doing this winter. I can just see Carol getting all excited over the first snowdrop--she probably had her camera out and was wearing a green sweater, right? I think the snow fairies are getting ready for a visit here this weekend, too. 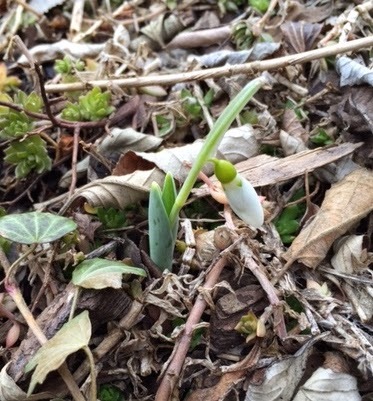 I've never considered a snowdrop to be blooming until it opened up, but now I know better. Maybe on light snow and then spring time? We are getting rain and some more cold here but not freezing. The reason your snow fairies have so stingy with the snow is because all of our snow fairies here in Massachusetts are hogging all of it. Believe me, I am all for them sharing the fun, but the mere suggestion of that seems to bring about another tempest... These fairies can be quite temperamental when they want to be..